AUGUSTA — Police are urging motorists to avoid a section of Water Street where a truck tipped under the railroad trestle. 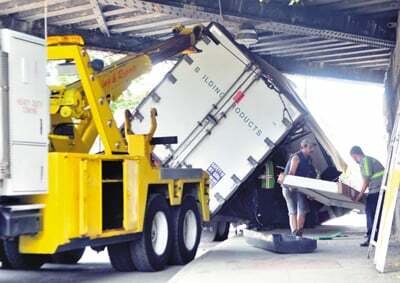 AUGUSTA — A truck tipped under the railroad trestle on Water Street Thursday, delaying traffic downtown. The accident happened around 11 a.m. as the moving truck was heading south, said Augusta Police Lt. Christopher Massey. The driver’s identification was not immediately available. “The driver has traveled this route many times,” in trucks that made it under the trestle, Massey said. The impact dislodged the mostly-empty, detachable box from the truck. Clamps and gear that hold the box to the truck had to be cut so that the box could be removed and attached to another truck for removal, Massey said. “Due to the damage and angle at how it struck the truck … it took a long time,” Massey said. The section of Water Street was closed for about one hour, but the northbound lane was closed for about four hours, Massey said.